This is a great spot to drop in for a quick meal while wandering the Dupont area. 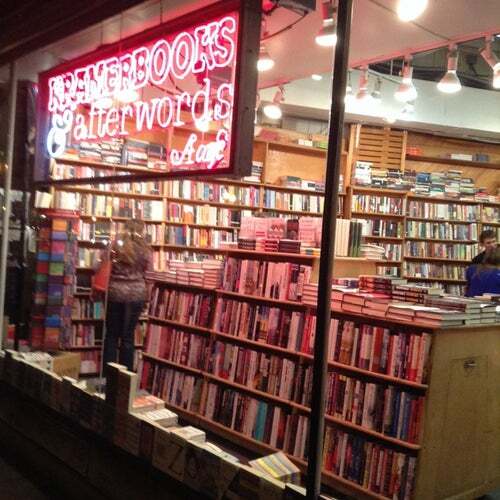 Afterward, check out the book store's extensive gay and lesbian section. I always look forward to the desserts at this place. I've been coming to this place for over 25 years, both when I lived in DC and after moving away . . . I love the bookstore and cafe combination. This is a great place to get in some "me" time. The atmosphere is very conducive to lingering over coffee and a light meal, while reading or relaxing. And the book end of the restaurant is also worth perusing. Unfortunately the neighborhood is on the downhill slide, with the closing of several gay landmarks. Kramerbooks remains a reminder of how eclectic and trendy Dupont was in years gone by. Dupont Circle seems to be devoid of anywhere to go for breakfast on a weekday, but Kramerbooks & Afterwords is the one fabulous exception. The menu was short and sweet, but included some great omelets, benedicts, and other breakfast staples (my whole-wheat belgian waffle was terrific!). The Cafe area is in a glass enclosed outdoor patio that looks like it can be opened up in summer weather, and while simple, the decor was pleasing enough. Good wait-staff and happy customers made for a pleasant morning. And when you're though, you can browse the fabulous bookstore for anything from gay fiction to political commentary.